Though difficult to see from a distance, these Karen Millen Flagship Masonry Pin-Up Hooks were nevertheless very distinctive from mid- and short-range viewing distances. 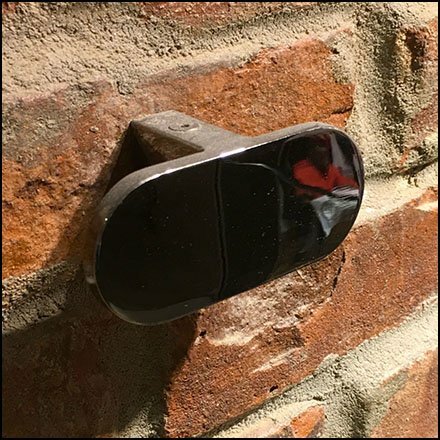 Masonry attachment for display (Pin-Up Hooks) or casual fitting room hanging (Clothes Hooks) is not seen often. Obviously installation via Molly is easily possible, if only you have Molly on hand. Otherwise attachment to framed walls is the easier alternative. These Masonry Pin-Up Hooks looks great on their own, but imagine the contrast of merchandise presented backgrounded by the rough brickwork. This Karen Millen Flagship Masonry Pin-Up Hook seen in Manhattan.